Central Retinal Vein Occlusion is a well defined clinical entity first described by Julius Von Michel in 1878. While there is no known specific treatment for this condi­tion. Fluorescein Angiography has helped in a slight better understanding of the problem and photocoagulation either with the Argon Laser or the Xenon arc has helped in arresting the progress of a CRVO into neovascularisation, rubeosis irides and thrombotic glaucoma. Recently Hayreh , has separated CRVO into the Ischaemic type or the Haemorrhagic type where the prognosis is worse when compared to the non-ischaemic type or Venous stasis retinopathy where the final outcome of the disease is benign. The records of 75 patients on whom a diagnosis of CRVO was made were studied in retrospect. 17 eyes where the diagnosis was in doubt, or documentation and follow­up were inadequate have been eliminated, leaving 58 eyes of 58 patients for study. While most patients (34) were over 50 years of age, the remaining were between the age group of 20-50 years. 45 were males and 13 females. 23 had no systemic disease while 3 had ischaemic heart disease and the remain­ing had either diabetes, systemic hyperten­sion or both. 19 patients were already on platelet inhibitors (9), Vaso-dilators (5), anti­coagulants (4). 3 had undergone photocoa­gulation prior to our examination. Apart from a detailed basic ophthalmolo­gical examination which was done in all the eyes, fluorescein angiography was performed on 36 eyes and fluorescein ophthalmoscopy on 2. Eyes in which the fundus showed numerous splashes of superficial retinal haemorrhages and where the media was unclear were not subjected to fluorescein angiography. 19 eyes were subjected to Pan­retinal photocoagulation. The Argon Laser was used in 13 eyes and the Xenon arc in 1. In 5 eyes both instruments were employed. Peripheral cryo ablation was resorted to in addition to photocoagulation in I case. New vessels either on the disc or on the retina, or extensive areas of capillary non-perfusion as evident on the Fluorescein Angiogram formed the indication for treatment. Photo­coagulation was not contemplated in 14 eyes where there was no demonstrable neo­vascularisation, and in 13 whose fundus was splattered all over with superficial retinal haemorrhages. In I eye the media was un­clear and 10 patients did not turn-up for treatment when told that treatment would not result in restoration of vision but only prevent certain sequelae of the disease. The total number of photocoagulation burns ranged from 500 to over 2000. Spot-sizes of 500 and 200 microns on the Argon Laser, and 3 and 4.5° on the Xenon were used to create moderately heavy burns by choosing the appropriate power and exposure time. As much of the retina as possible was ablated the limiting factors being cataracts and viiiecus haemorrhage. Fluorescein angiography was repeated in 8 eyes. The he follow­ up period of both photocoagulated and un photocoagulated eyes ranged from one month to over a year [Table - 1]. 43 Fellow eyes showed normal fundi, 6 had diabetic retinopathy, I had hypertensive retinopathy and 1 BRVO. Chronic simple --laucoma was seen in 8 eyes. The visual loss in the eyes described was varied [Table - 2] The association of systemic disease to CRVO was found to be more as the patient's age increased [Table - 2]. The intraocular pressure was normal in 47 eyes while chronic simple glaucoma was an asso­ciated feature in 10 eyes. Only 1 eye had thrombotic glaucoma and rubeosis iridis was evident in this eye alone and absent in the remaining 57. Ophthalmoscopy showed one or more findings characteristic of a CRVO. Venous dilatation was seen in 25 eyes, and 13 had disc oedema. The entire posterior pole was splashed with multiple superficial haemorrhages in 23 eyes while such haemorr­hages were few and scattered in 32. Disc neo-vascularisation was evident in 7 eyes and macular oedema observed in 4. Vitreous haemorrhage had occurred in only 5 eyes and in all instances permitted adequate funds visualization. An associated central retinal arteriolar occlusion w as suspected in 2 eyes. Of the 36 eyes subject for fluorescein angiography, 13 showed leakage of dye from the optic disc. In I 1 eyes leakage was from new vessels and in 2 leakage was due to dilated capillaries on the disc. 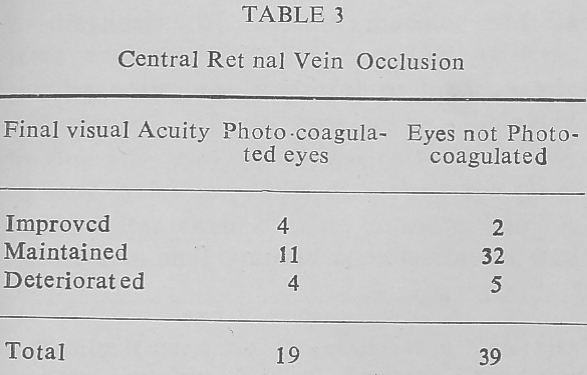 Capillary non-perfusion of varying degrees and extent was seen in 23 eyes. However, in most eyes, the area of capillary non-perfusion was exten­sive and was of severe degree. In 11 eyes the capillary circulation was intact. A delay in venous filling could be documented in 10 eyes. Venous emptying was normal in all eyes. Non-cystoid oedema at the macula in 6 eyes, cystoid macular oedema in 2 and leak from new vessels on retina in I were the other angiographic features. The visual acuity in 5 eyes where photo­coagulation was not done worsened and 2 improved. 32 did not show any change. 7 eyes developed a vitreous haemorrhage and rubeosis iridis developed in 3 resulting in thrombotic glaucoma. It is usually believed that CRVO occurs in the elderly. Its occurrence in 24 patients under the age of 50 years is significant. The increased association of systemic disease to CRVO as age increases is also a significant finding. We find in this series that visual acuity need not be always grossly affected in CRVO. Taking Hayreh's classification into account, we find that most patients who can be grouped under haemorrhagic type of CRVO had a severe visual loss to mere CF or PL, whereas most patients with venous stasis retinopathy had visual acuities ranging from 6/5 -6/12. A few eyes in this group however, had severe visual loss to <6; 60 or CF/PL. These few eyes are probably ones where the numerous superficial retinal haemorrhages had cleared at the time of our examination and they should rightly belong to the category of haemorrhagic retinopathy. The fact that 3 eyes out of 11 in the venous stasis retinopathy category showed leakage of dye from new-vessels on the disc demonstrates that venous stasis retinopathy need not always be benign. We have in an earlier study on disc neo-vascularisation observed that an eye can develop disc neo-vascularisa­tion despite a good peripheral capillary circu­lation. In this series we cannot really compare photocoagulated and un-photocoagulated eyes because cases for photocoagulation have been either selected or rejected based on previously well known guidelines. However, we wish to stress that 9 of the eyes which met our criteria for photocoagulation had good visual potential and that photocoagulation bad helped these patients not only from possible thrombotic glaucoma at a later stage but also in helping them to retain useful visual acuity. The deterioration in 2 eyes with 6/12 vision tells us that a good initial visual acuity really does not mean a good prognosis. The regres­sion of disc neo vascularization after photo­coagulation in 6 out of 8 eyes, the regression of retinal Dec-vascularisation in 4, where fundus fluorescein angiography was repeated, the non-occurrence of vitreous haemorrhage in 16 eyes, non-occurrence of thrombotic glaucoma in 18 and the visual results under­score the need for photocoagulation in selec­ted eyes after fluorescein angiography. In eyes with capillary non-perfusion alone and without neo-vascularisation, one may either do a Pan-retinal photocoagulation or wait till neovascularisation become demonstrable. In this series, we treated some such eyes with photocoagulation and watched the result. One problem in watching could be that a patient might have developed not only neo­vascularisation but also a significant vitreous haemorrhage in the follow-up period which will make useful photocoagulation difficult. When looking at the results in eyes where photo coagulation was not due, we feel that adequate photocoagulation at the appropriate time would have reduced the complication in at least some of these eyes. 58 eyes with central retinal vein occlusion have been studied and the role of photocoagulation stressed. The characteristics of the haemorrhagic type of CRVO and venous stasis retinopathy has also been analysed from the view point of patients' age, visual acuity, ophthalmoscopic and fluorescein angiographic features and response to photocoagulation. Gass, J.D.M., 1968, Arch. Ophthalmol 80: 550. Hayreh, S.S., 1965, Brit J. Ophthalmol 49: 626. L' Esperance, F A. Jr , 1975, Ocular Photo­coagulation The C.V. Mosby Co.
Priluck, I.A. et al. 1980, Amer. J. Ophthalmol 90; 190, The C.V. Mosby Co.
Schatz, H , 1978, Interpretation of Fundus Fluorescein Angiography; The C.V. Mosby Co.
Zweng, H.C., 1977, Argon Laser Photocoagu­lation; The C.V. Mosby Co.